Map of Turkey in Asia. (Asia Minor). 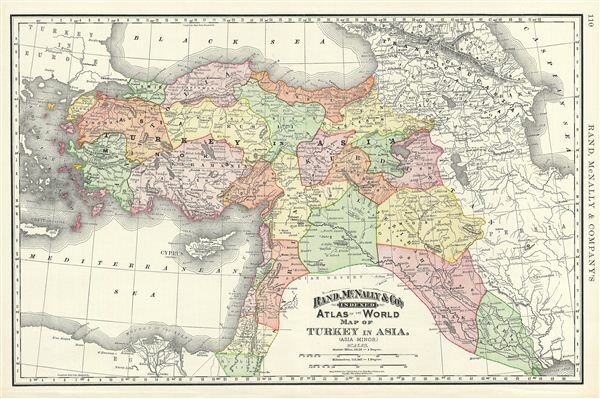 This is a beautiful example of Rand McNally and Company's 1892 map of Turkey in Asia or Asia Minor. It covers from the Black Sea to the Mediterranean and from the Aegean Sea east as far as the Caspian Sea. The map essentially covers the late-19th century claims of the Ottoman Empire, including the modern nations of Turkey, Armenia, Iraq, Syria, Kuwait, Jordan, Israel or Palestine. The map dates to the last days of the Ottoman Empire, whose influence, though rapidly declining, still dominated much of the Middle East. Color coded according to regions and territories, the map notes several towns, cities, rivers and various other topographical details with relief shown by hachure. This map was issued in the 1893 issue of Rand McNally and Company's Indexed Atlas of the World - possibly the finest atlas Rand McNally ever issued. Rumsey 3565.029 (1897 edition). Philip (atlases) 1026 (1898 edition).